Not Getting Enough Vitamin D? Most Americans fail to meet the recommended vitamin D intake guidelines. The lowest vitamin D intakes are reported by people who obtained vitamin D from food only. Distressingly, insufficient intakes of vitamin D are more pronounced in teenage girls than in boys, in women than in men. These populations may need more bone support. Fortify your bones to the core. 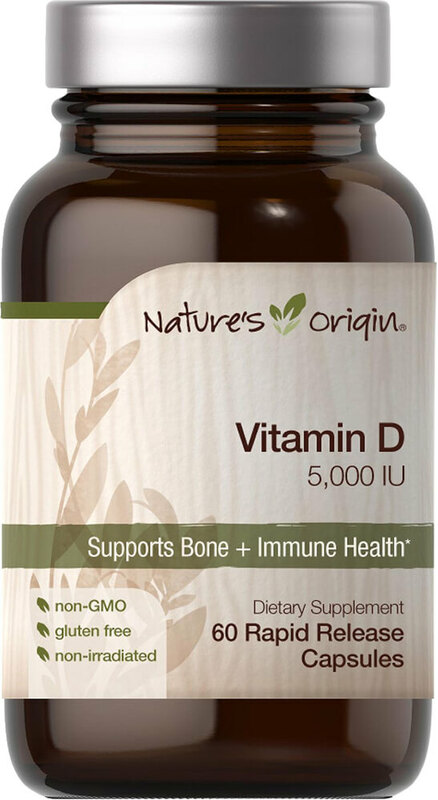 Nature’s Origin Vitamin D supplies D3: the superior form that is naturally produced in the body from sunlight. *Surgeon General’s Report on Bone Health and Osteoporosis. Vitamin D may get harder to absorb and synthesize as we grow older. Lack of sunlight exposure may reduce vitamin D levels in the body. Use of sunscreen products may reduce your body’s vitamin D production. Very few foods naturally supply vitamin D2 or vitamin D3. Nature’s Origin high-potency Vitamin D 5,000 IU can help. 1. Of adults 19 and older who obtained vitamin D from food only. Analysis of the NHANES 2001-2008 Data Set, Wallace TC et al. J Am Coll Nutr. 2013:32(5):321-30. Why Take Nature’s Origin Vitamin D?